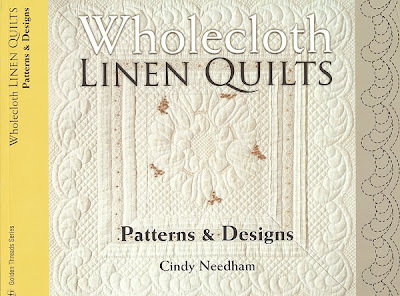 Cindy Needham is a renowned quilter, designer, writer, and teacher from California whose special interest is creating magnificent patterns on vintage linen (and occasionally on silk, as shown below). 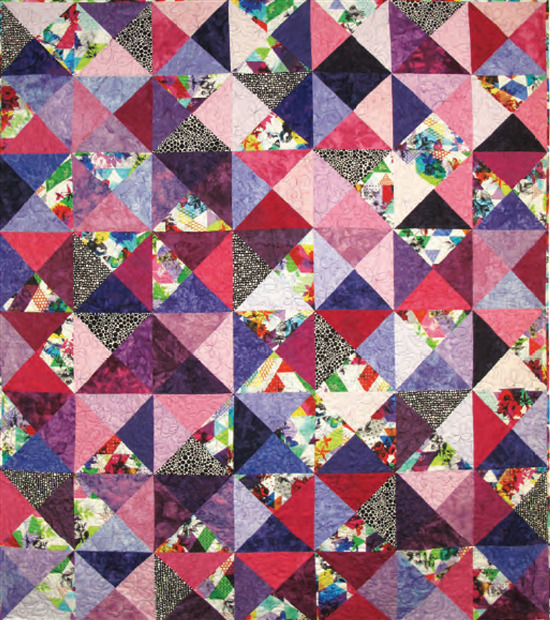 Quilting became Cindy's passion when her family was stationed in the Blue Ridge Mountains of Virginia and North Carolina, and she has now been quilting for over 38 years. 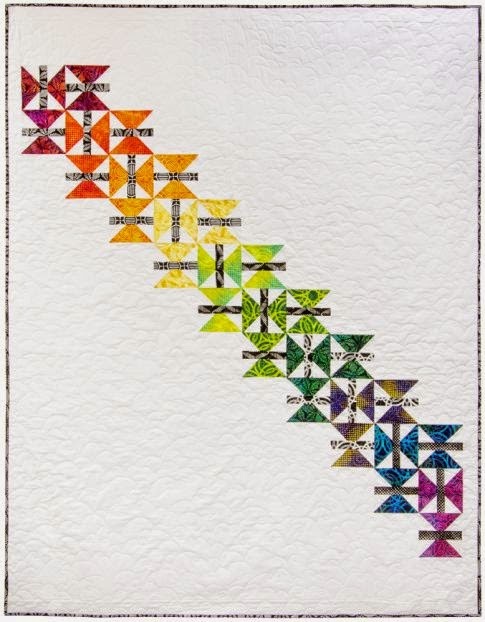 The first 25 years of her quilting career were dedicated to hand quilting, but for the past 13 years she has focused on machine quilting. 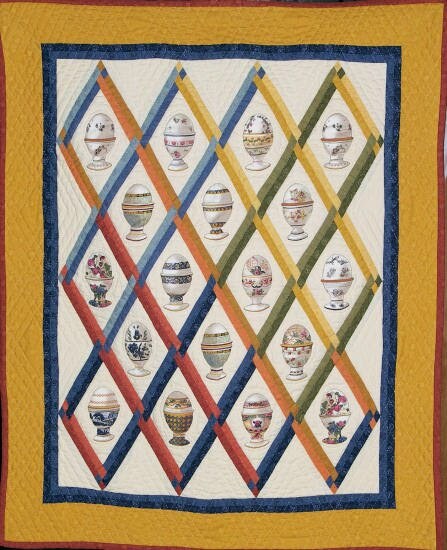 Feathered Crystals is an updated version of a wholecloth quilt, which was one of the earliest forms of quilting in the American colonies. 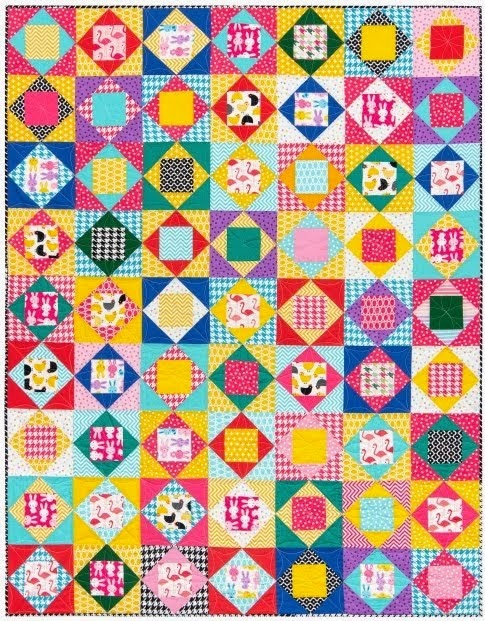 This is not a patchwork, but one single piece of fabric covered with thousands of tiny, amazingly precise stitches, which create the raised pattern of interlocking rings. 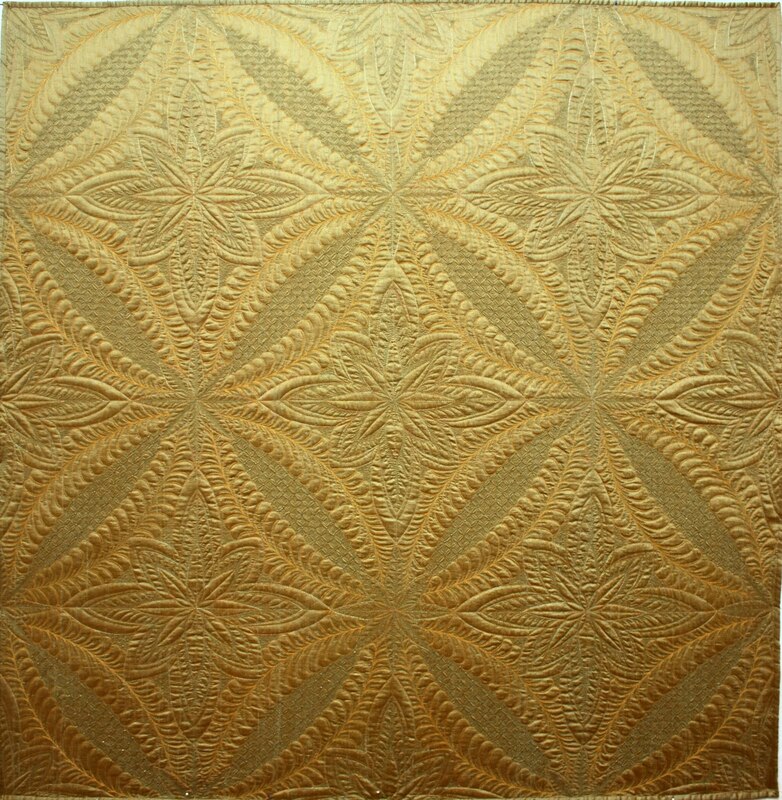 Our colonial ancestors often created quilted bed coverings from one large piece of woven flax and wool, known as "linsey-woolsy". 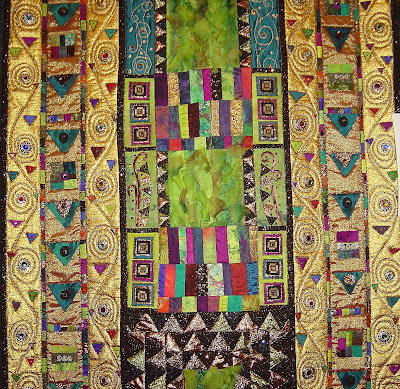 However, Cindy's quilting, above, was done on a whole piece of green dupioni silk. We're dazzled by the design and by the exquisite luminescence of the silk. 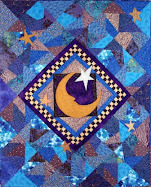 You can read about the creation of this quilt on Cindy's blog, here and here. 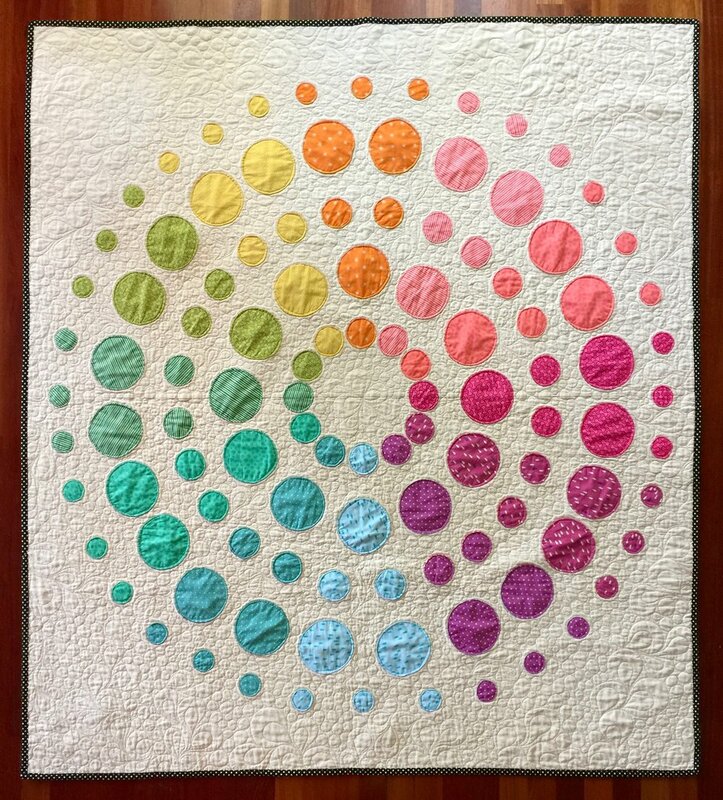 "Feathered Crystals" was recently displayed at the nationally renowned Empty Spools Seminars at Asilomar, California, where Cindy taught Stepping Stones to Beautiful Quilting. To read about the Asilomar experience and see some wonderful photos of the beach - and the workshop - visit Cindy's blog. Also check out the schedule of Cindy's popular classes and upcoming retreats. 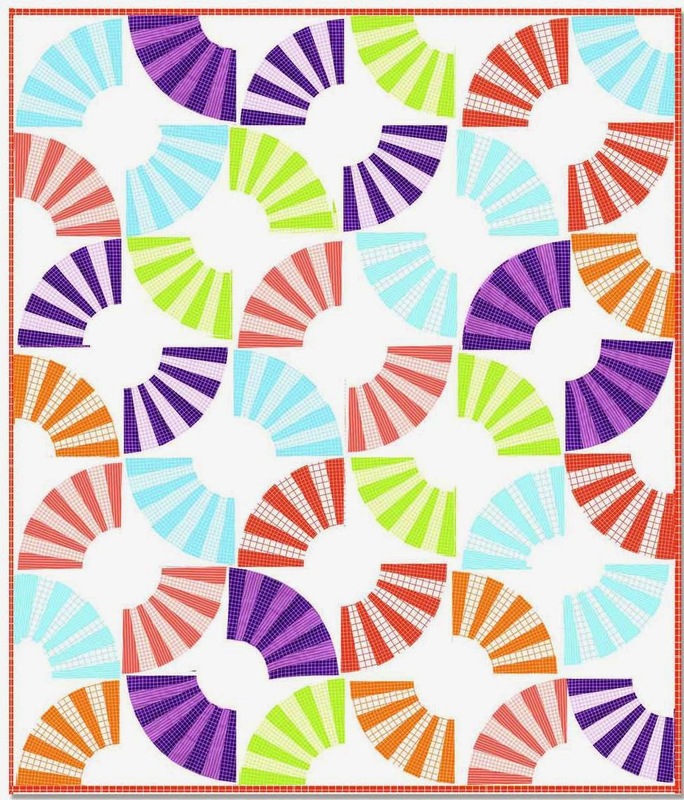 For her fellow quilters, Cindy has created an extensive line of original quilting patterns for stencils (these are copyrighted). 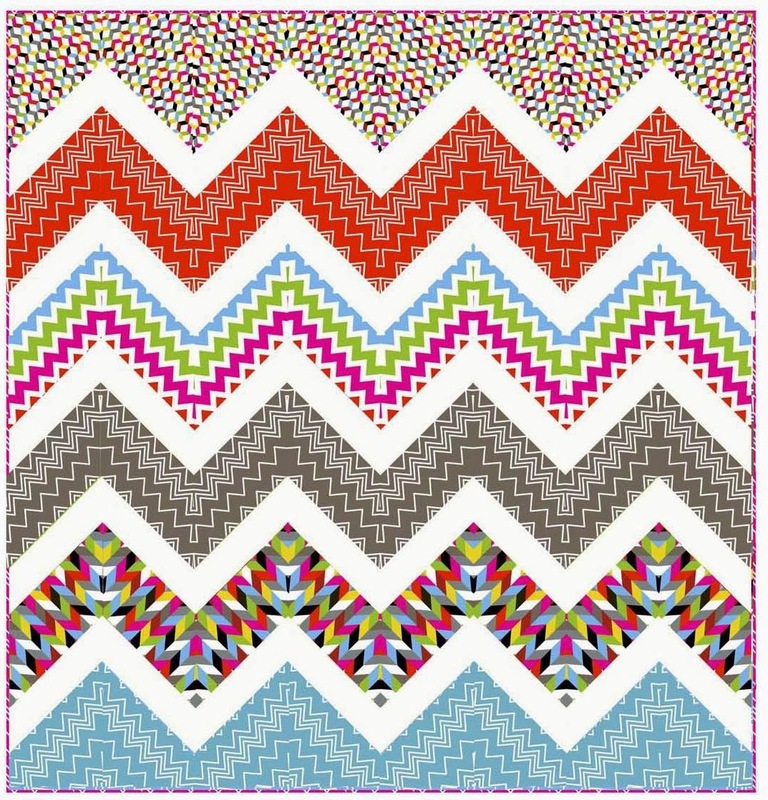 The patterns range from simple to ornate, and small to very large (very handy!) 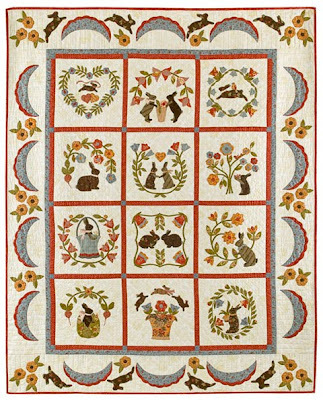 Her many charming designs include medallions, feathers, fans, circles, butterflies, and other motifs. 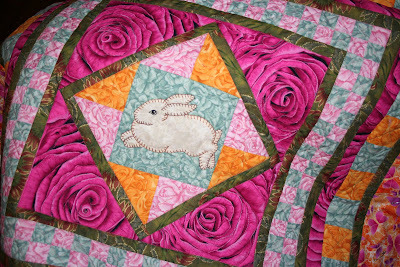 To view the complete line, see Quilting Creations. 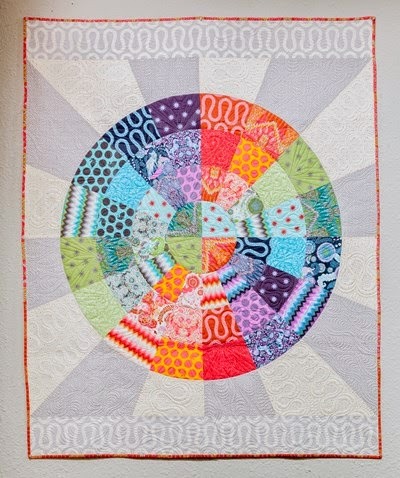 We're showing a few of them, above: Butterfly Wreath, Whirligig, Feather & Lines Circles. 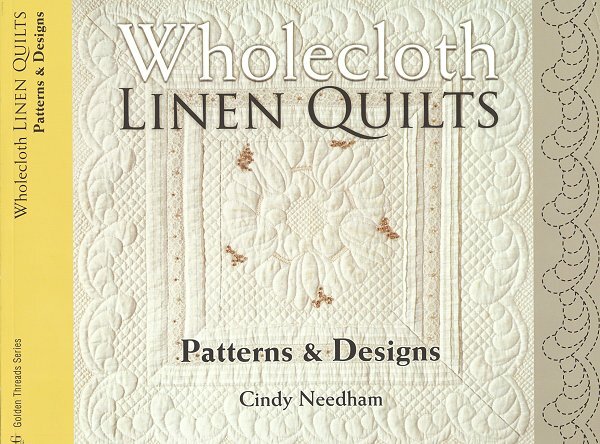 Cindy is also the author of the book, Wholecloth Linen Quilts: Patterns and Designs, which is available from the American Quilters Society. 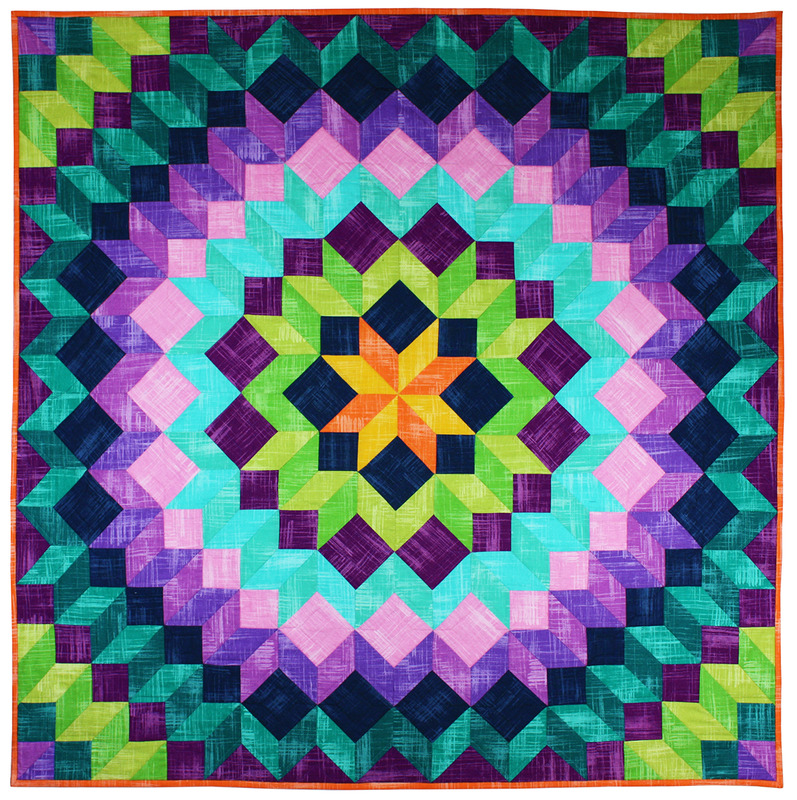 You can ogle the wholecloth quilts here, and read about designing and creating them. 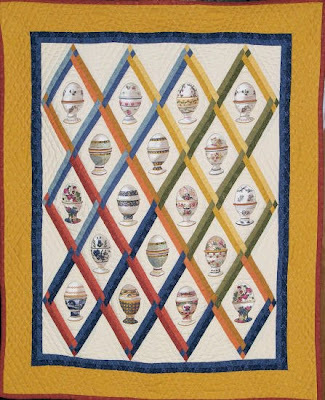 The pieces are often in miniature sizes and are frequently embellished with small pearls, transforming the quilts into bejeweled treasures. Images are courtesy of Cindy Needham. 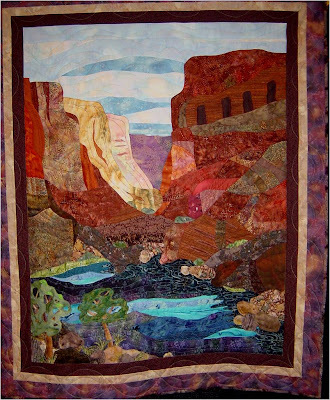 For more information and to view a gallery of her work, please visit Cindy's website. 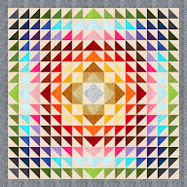 For information on next year's Empty Spools Seminars, see the 2011 schedule here. 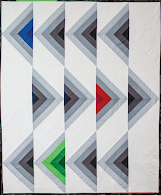 If you have a a black and white fabric stash and have been looking for ideas, or have always wanted to make or own a black and white quilt, we have some inspiration to share. 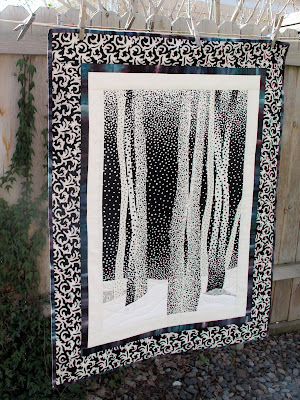 We love the sumptuous Winter Aspens quilt, above, with its clever use of dotted fabrics to portray a stand of trees in a wintry landscape. 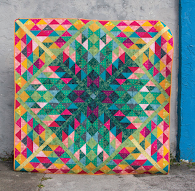 Thanks to Jayme Crow for supplying us with this gorgeous photo of the original quilt in a natural setting. 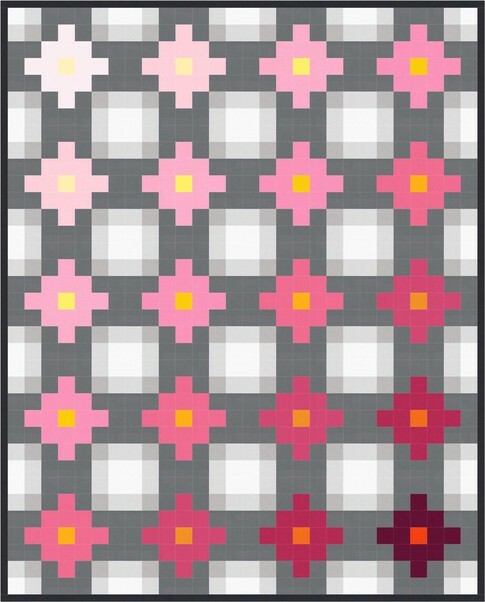 The pattern can be obtained from the Bella Nonna Design Studio. 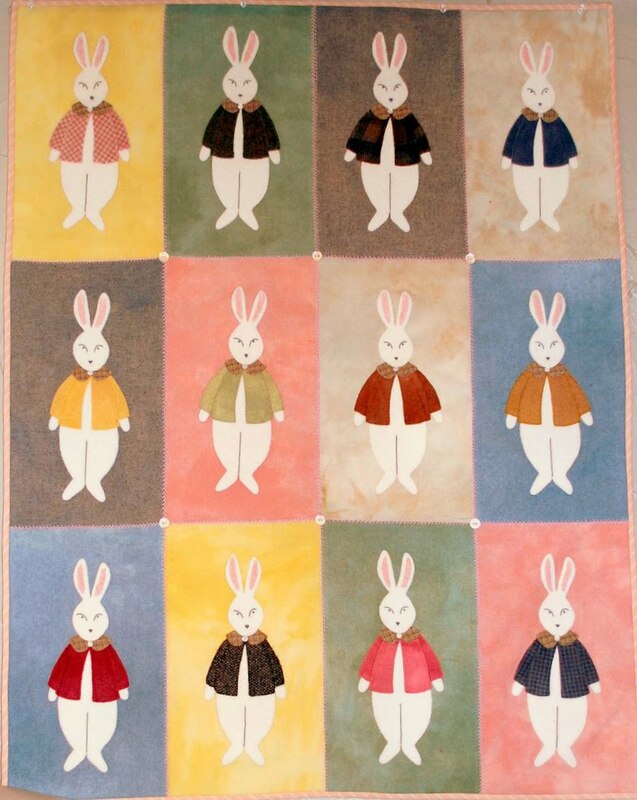 Jayme's design studio also has some very cool designer Japanese fabrics in heavy cotton. 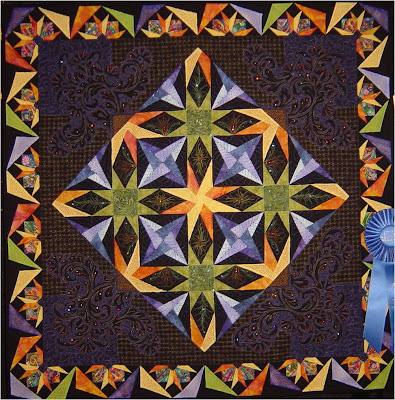 The very elegant "Duet" pattern by Connie Kauffman, above, is also easy. 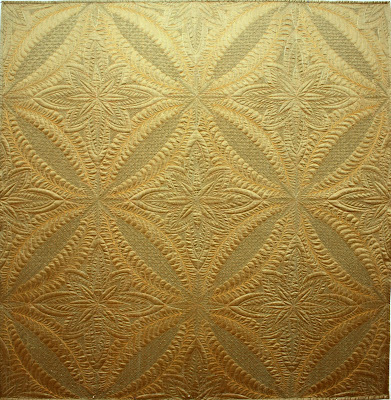 The shading of the quarter triangles gives a three-dimensional appearance to the center medallion. 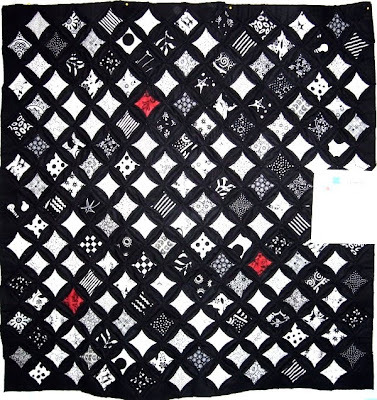 The solid black and white appliques are fusible; buttons add sparkle to the quilt. 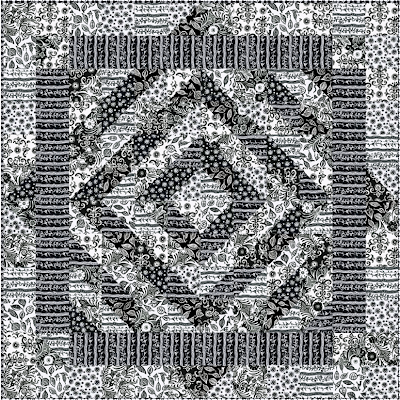 The pattern makes good use of fat quarters in black and white. 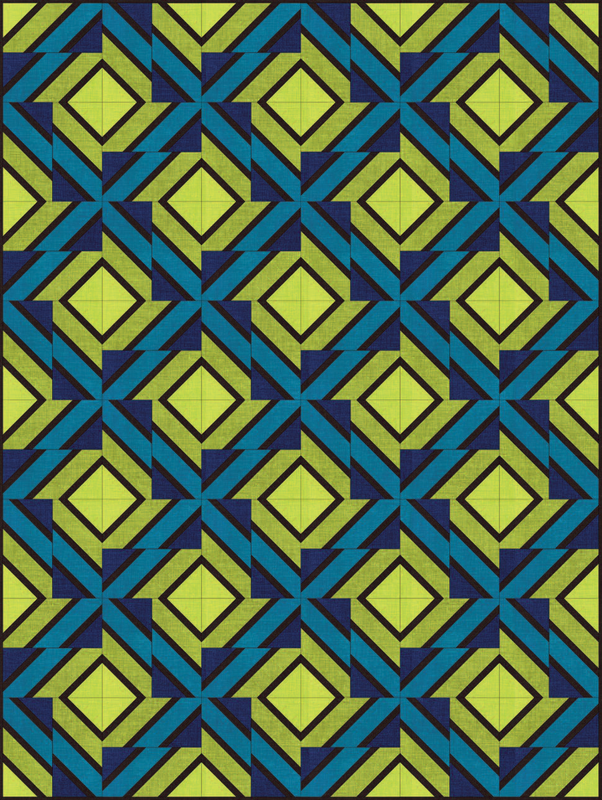 The pattern can be obtained from Quilters Warehouse. Do you believe in evolution? 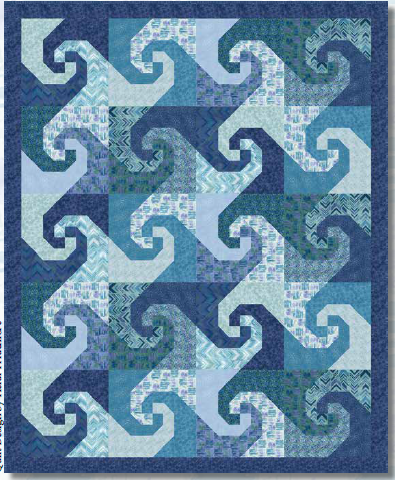 "Stormy Evolution" by Susan Varanka takes the Storm At Sea pattern to a new level. 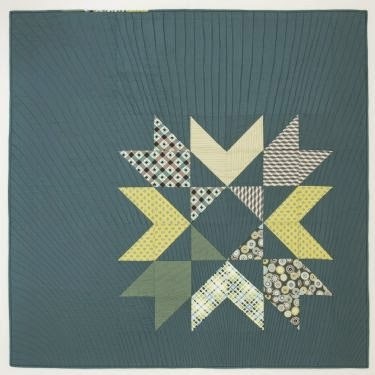 Notice that the individual stars surrounding the center are reverse images of the star design embedded within the Storm at Sea blocks, and that the pieced border is made up of the points of the blocks. 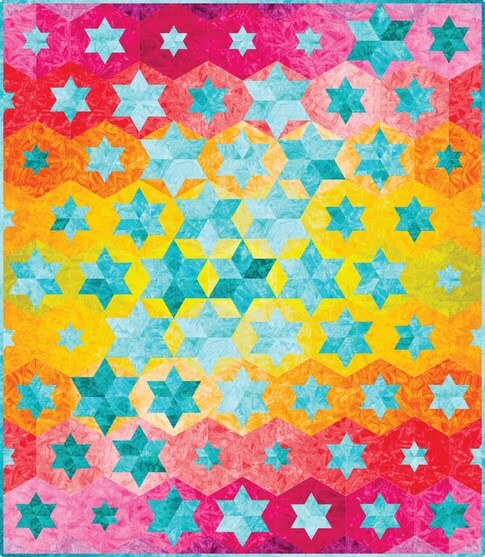 The repeating patterns in the stars and border unify the design. 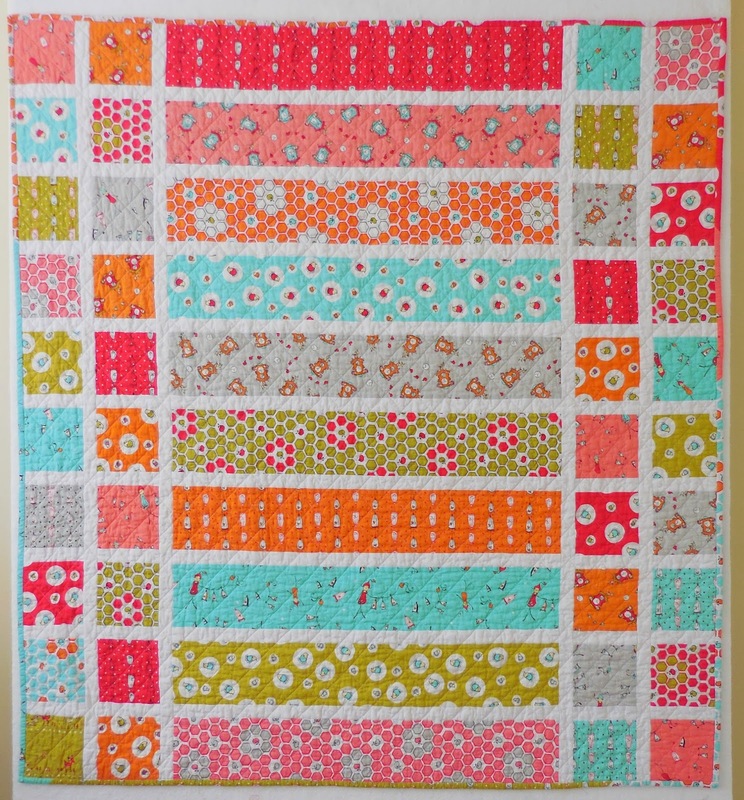 The quilt can be made with fabrics planned in advance, but is also perfect for scrap usage. 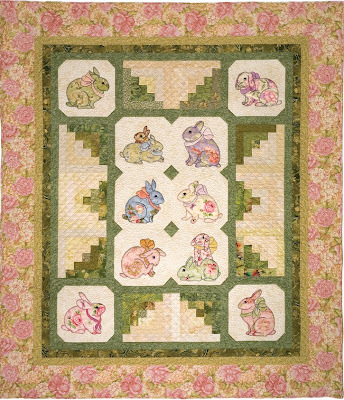 For more information, and to purchase the pattern, visit Susan's Quilt Creations. 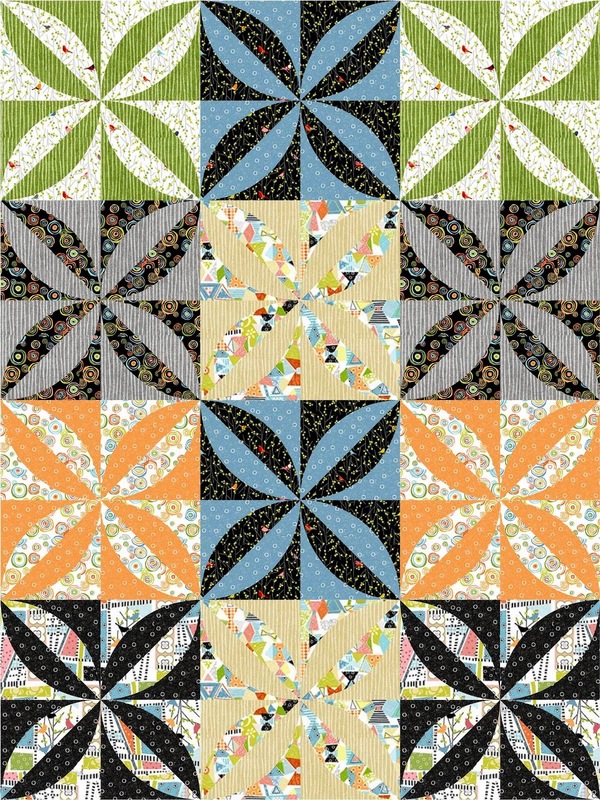 Midwinter garden is one of our favorite black-and-white fabric lines, with 12 different fabrics designed by Ellen Crimi-Trent (we're showing four of them, above). 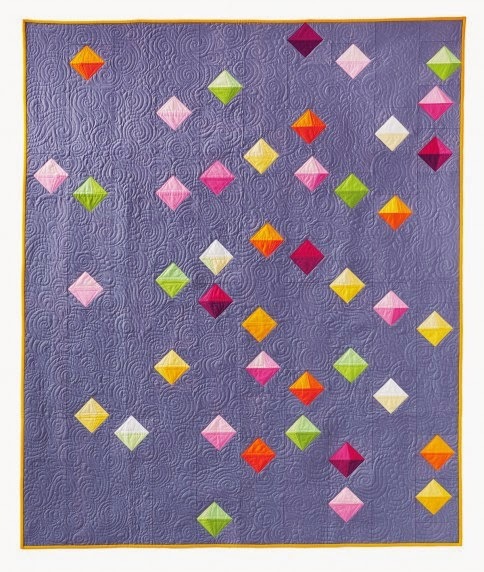 The quilt above incorporates the fabrics in a barn raising pattern, giving a subtle shadowy effect. 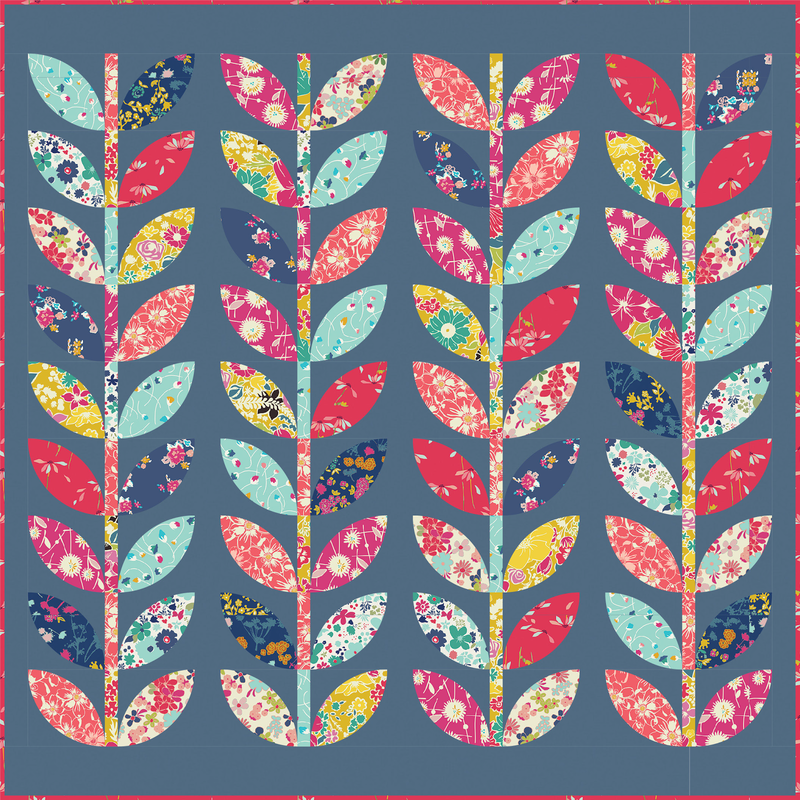 For a free download of the pattern and to see the other fabrics, visit Clothworks. 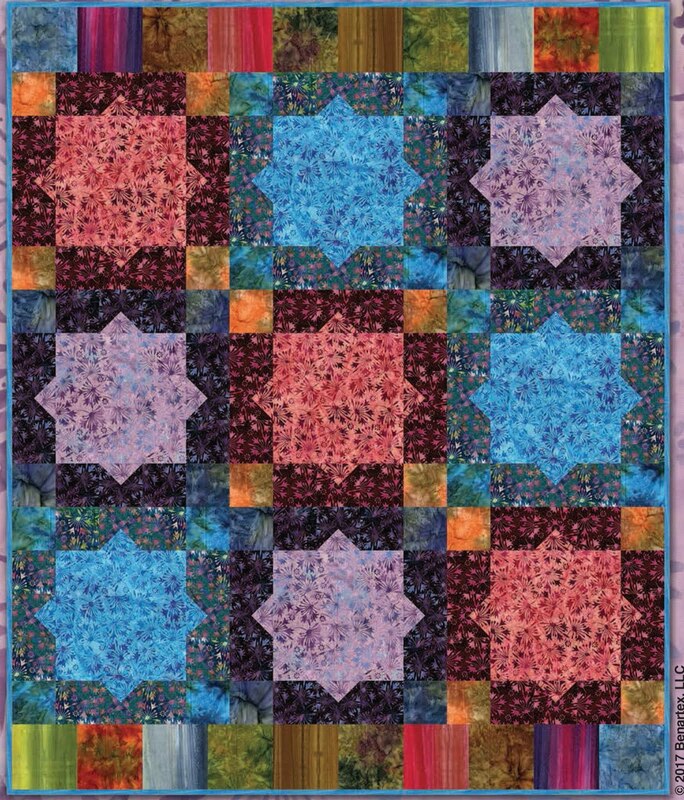 The "Mod Quads" design by Janine Burke at Blue Underground Studios can be made with many different fabrics. 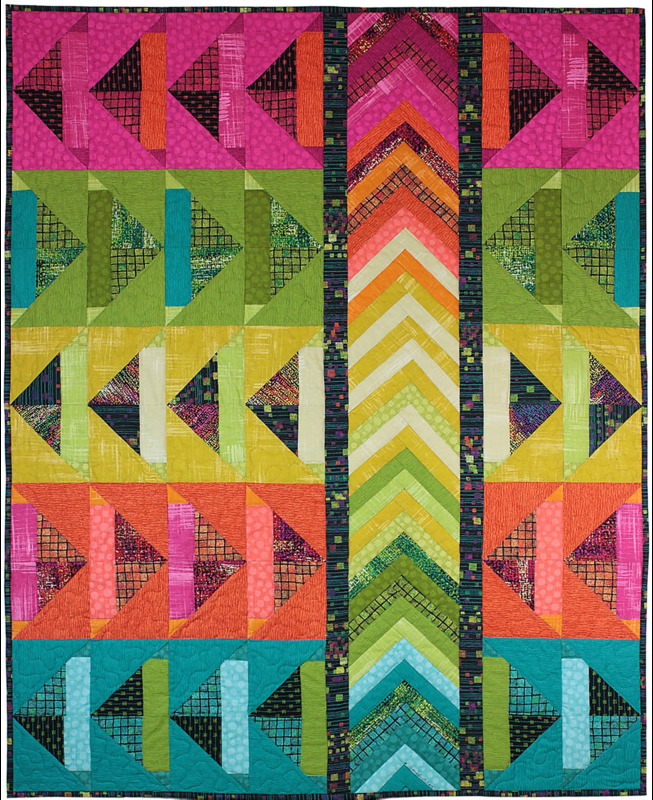 The skinny "quads" add just a hint of color for visual interest. 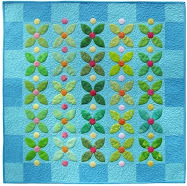 For those who desire a speedy project, a complete quilt kit is available at The Quilters Garden. 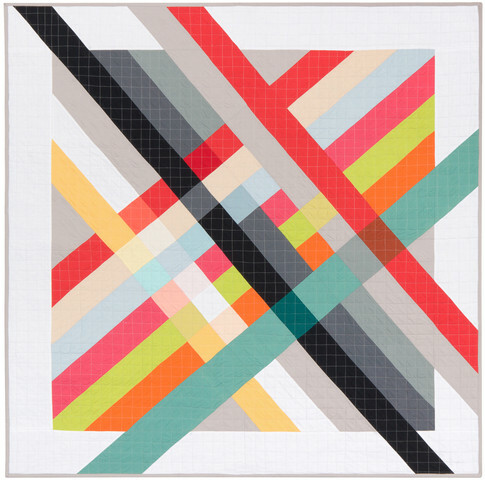 We love this modern and musical wall hanging by Connie Kauffman. 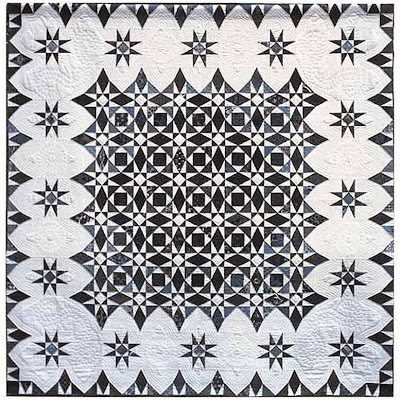 Black and white notes radiate out from the nine-patch blocks, which are set on point, such that the blocks appear to be spinning like whirlygigs. 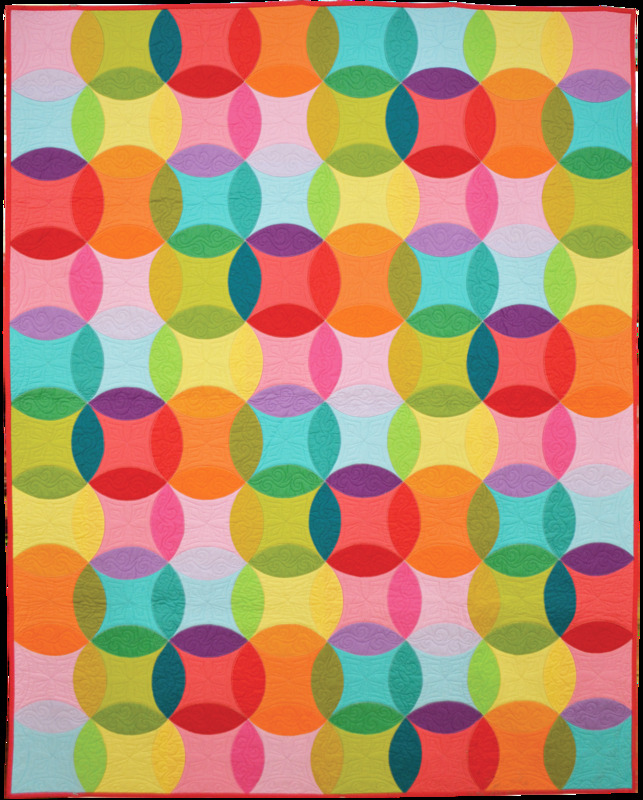 The brightly colored center blocks stand out nicely from the background. 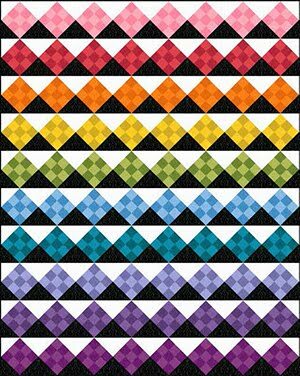 The pattern can be obtained online from the Quilters Warehouse. According to the Merriam-Webster dictionary, a Fandango is "a lively Spanish or Spanish-American dance in triple time that is usually performed by a man and a woman to the accompaniment of guitar and castanets." O-kay! 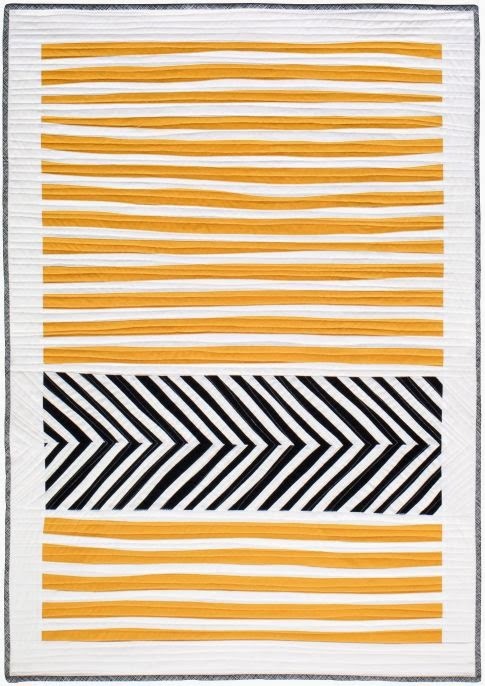 The Zebra Fandango quilt features intricate foundation pieced blocks set at a slight angle to create the lively design. The pattern was published by Down Under Quilts in November, 2004. 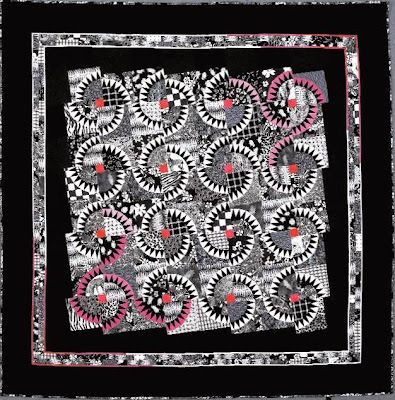 A version of "Zebra Fandango", by Ana Buzzalino, can also be seen at American Quilter. 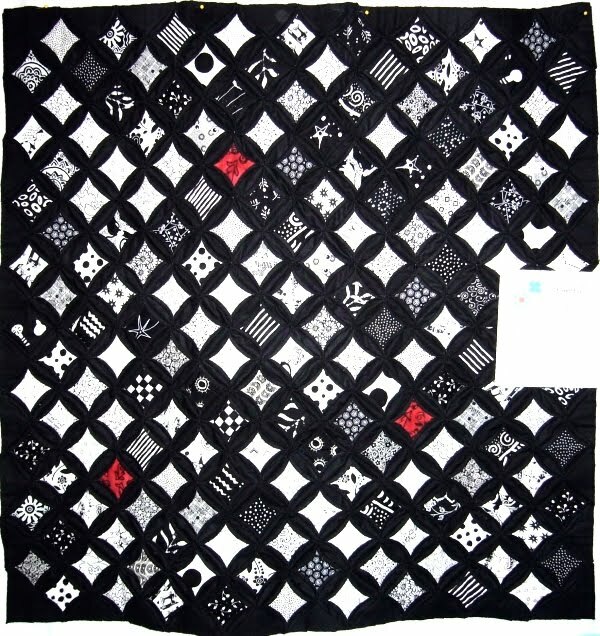 In 2006 the Rising Star Quilters Guild of Lexington, MA, held a quilt challenge: Black and white with one accent color. 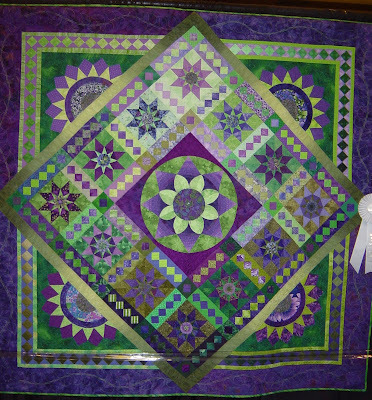 Shirley Ament-Bergey won second prize for her fabulous cathedral windows quilt, above. 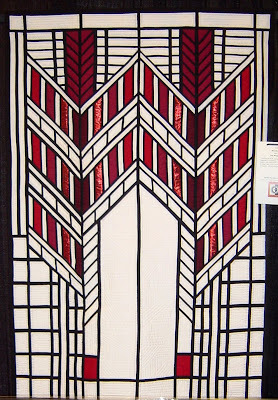 The wall hanging was made for Shirley's son, who is a devotee of contemporary design. 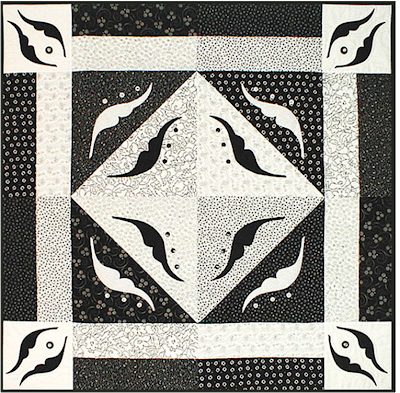 The red "eyes" make an outstanding contrast amidst the black and white, and the variation of prints - some nearly all black, and some nearly all white - creates a lively design. 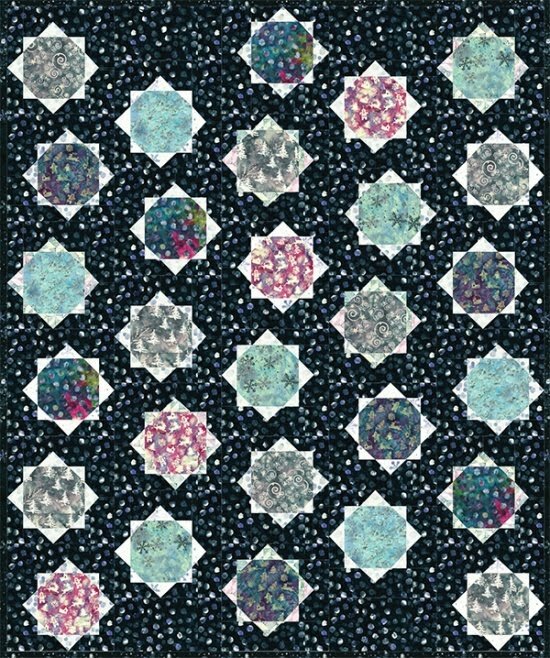 You can see Shirley's quilt and 30 other black-and-white challenge quilts on the RSQG website, here (A-J) and here (K-Z). 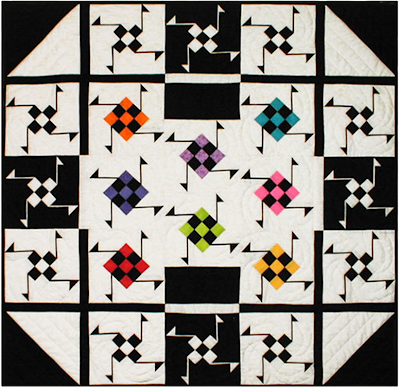 As you may know, Kay M. Capps Cross wrote the books on black-and-white quilts (literally). Kay says: "I use black and white (with the ever-present dash of vivid color) because it challenges me and seems to work the best for expressing my ideas and spirit. Some have called me “the black and white lady,” and I just love that!" 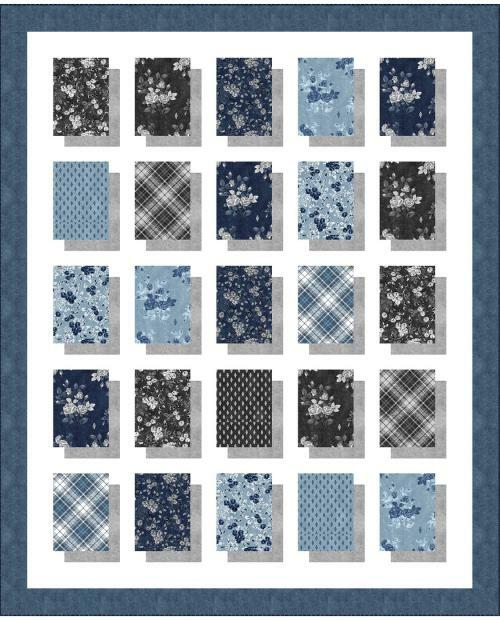 Kay's books, shown above, are available at Amazon, at local quilt stores, and many other places. 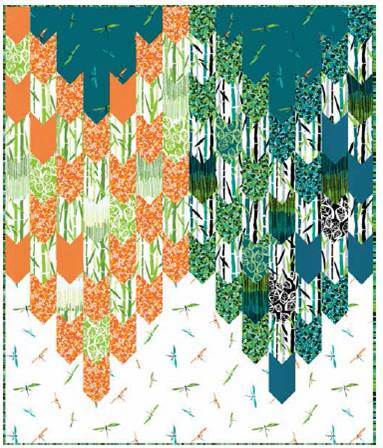 Kay's patterns, including "Hello, Heliconia" (above, 21.5 x 38.5) are available at the Quilters Warehouse. 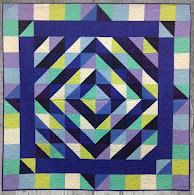 For more information, visit Kay's site at Cross Cuts Quilting. 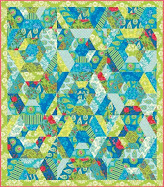 See the Winter 2008 issue of Fabric Trends for Quilters. 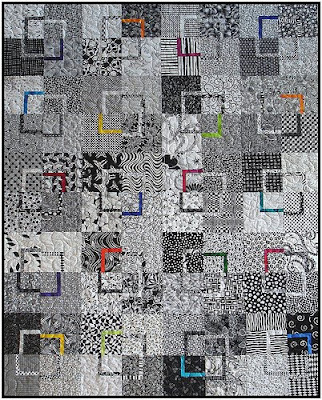 You may also be interested in the recent black and white quilt challenge (the challenge group's photos are on Flickr). If you know of other black-and-white challenges or exhibits - we'd love to hear about them! Claude Monet was one of the best loved Impressionist painters of the late 19th-early 20th century. He painted many scenes of his gardens at Giverny, in the northwest of France, which is shown in the photo below. Monet was fascinated with the way that bright light fell from the sky and diffused upon the trees, grasses, and water surrounding him. He painted the effects of light in nature with rapid, deft, brushstrokes and broken patches of vivid color. 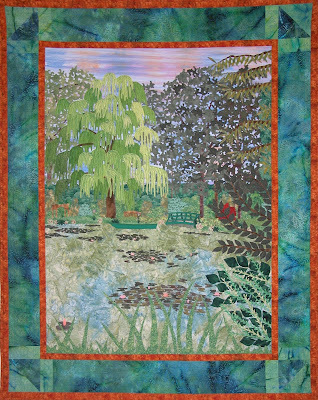 Today, we are featuring four landscape quilts which celebrate Monet's garden and his brilliant "plein-air" style of painting. 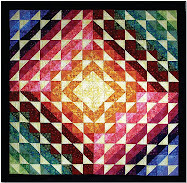 Darlene Sweetwood has created a beautiful quilt, awash in light and shadow. This work focuses on the water, bridge, and sunlight that Monet saw as he painted. 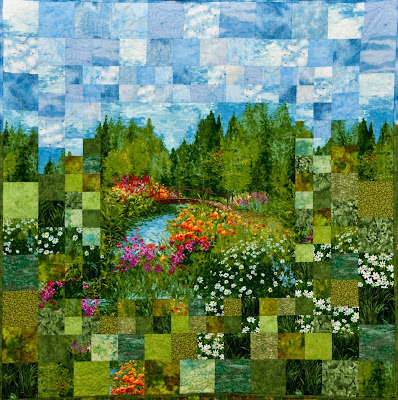 Darlene used diamond piecing to portray the quick, energetic brushstrokes of Impressionism. 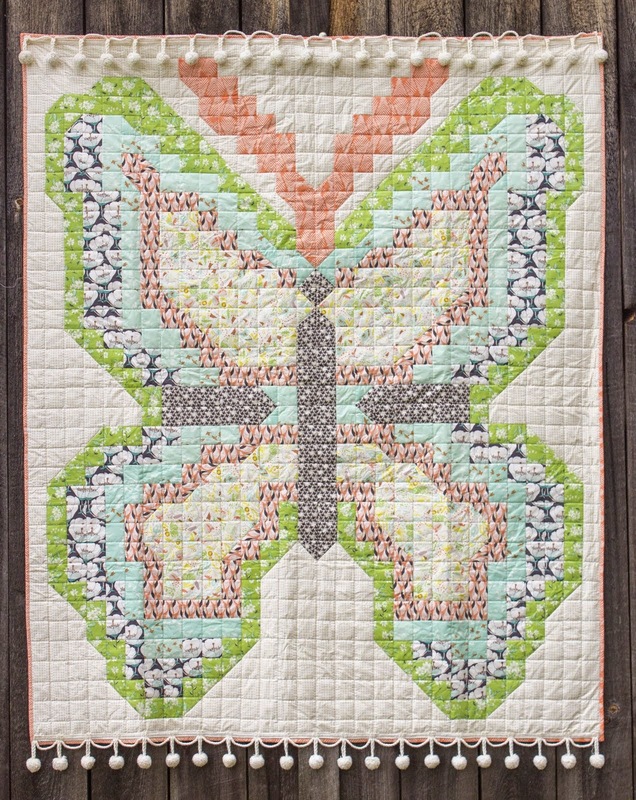 The lilypad and dragonfly perched on the border draw the viewer's eye into the gently rippling azure pond. 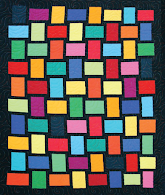 For more information on Darlene Sweetwood's quilts, visit Quilters Fabric. 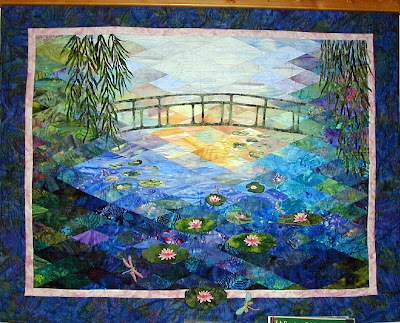 "Serenity Bridge" was designed by Marinda Stewart for Michael Miller fabrics, using a solid fabric panel in the center to portray the graceful bridge over the lake. 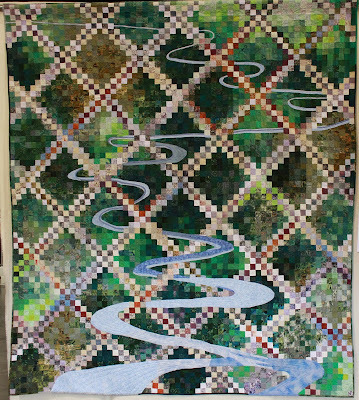 The quilt is constructed by using watercolor piecing techniques around the lake and background trees. The shimmering blue, green and white prints lend a light-dappled warmth to this cheerful scene. 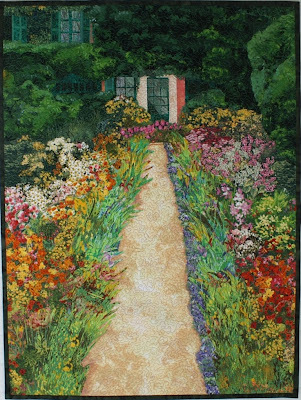 "Monet's Garden Walk" beckons us to wander up a flower bedecked path to experience a rainbow of floral color. 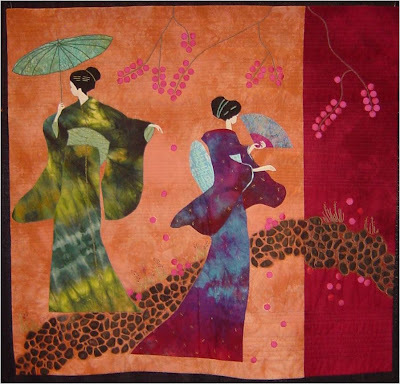 Lenore Crawford has used precise fabric painting, so that the Impressionist tradition of using both warm and cool hues of nature takes full effect. One of Lenore's passions is painting the landscapes of France. She has captured the garden as Monet himself must have seen it in springtime, burgeoning with fresh grasses and blossoms. 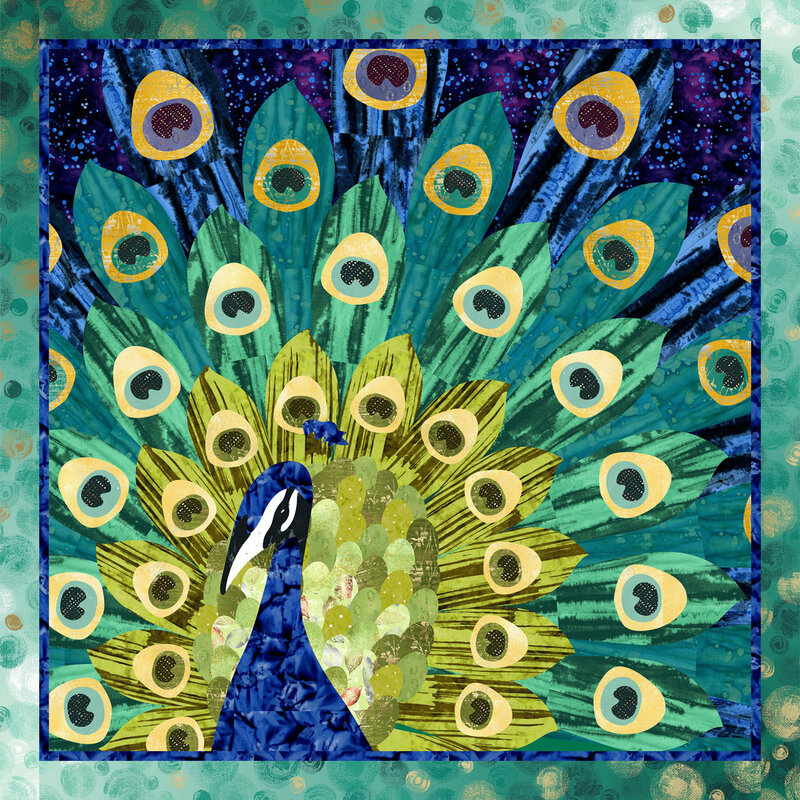 For more information on Lenore Crawford's award-winning artwork, visit her website and blog. Lenore also teaches workshops on her fusing and fabric painting techniques. 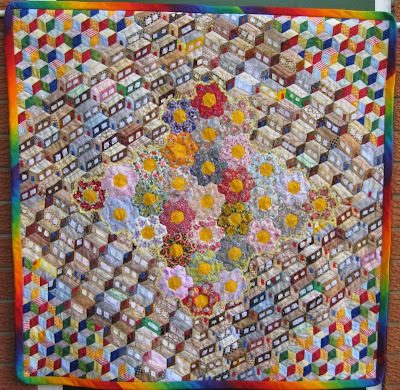 Joan Jamieson was commissioned to create this quilt by a couple who had just returned from Giverny and who wanted a reminder of their wonderful vacation. 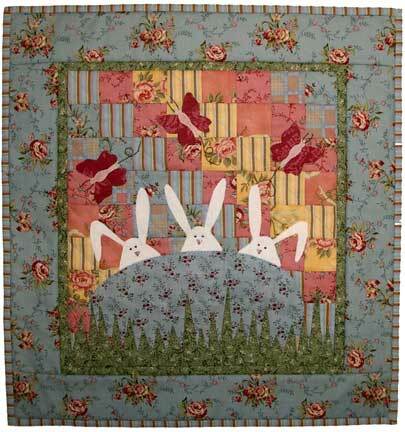 She used an endless number of tiny pieces of blue and green fabric to construct this delightful scene. In order to add contrast, she created delicate pink flowers for the lily pads on the lake and added beautiful pink clouds to the sky. 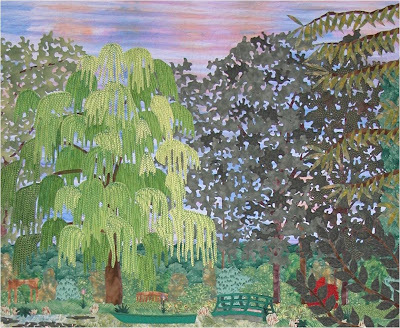 The graceful willow tree provides an intricate focal point, as she has lavished it with thousands of perfectly placed stitches to give it added texture. 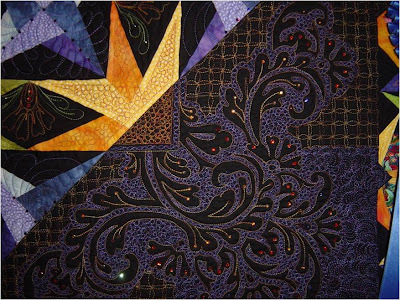 You can see a close-up of Joan's beautiful applique and quilting in the image below. 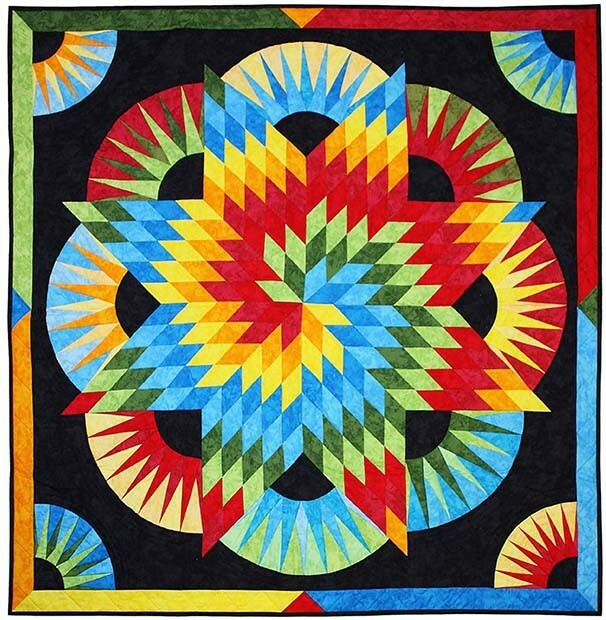 For more information about the creation of the above quilt, visit this webpage; and to see more of Joan Jamieson's quilts, visit her online galleries at Quilted Views. 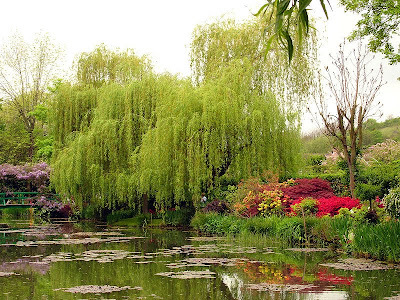 Photo Credit: Photo of Monet's Garden, by Michael Scaduto at Wikimedia Commons. 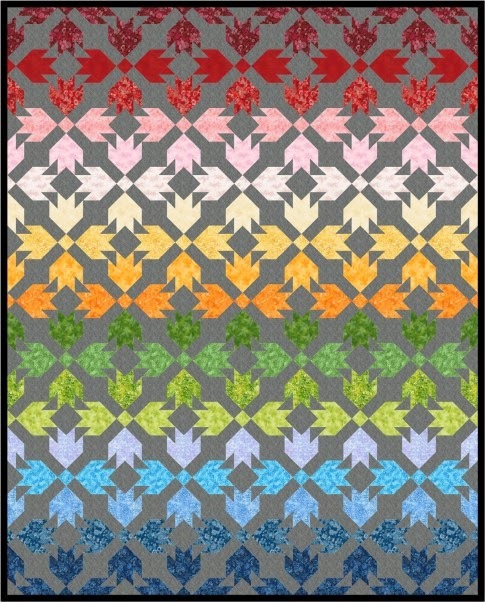 One of the beauties of tumbling blocks patterns is the seemingly infinite, and interesting, variations that are possible. 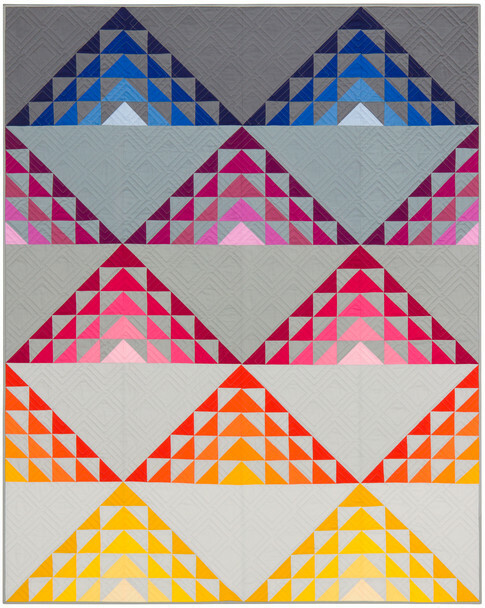 Today we're showing several of our favorite contemporary quilts that incorporate tumbling blocks in some form: small or large, hollow or solid, floating or tessellated. In Hollow Cube, the faces of the large tumbling blocks have been cut out, leaving a frame around the openings. The openings are filled with triangles, which are shaded to represent the back, floor, and sides of the cubes. 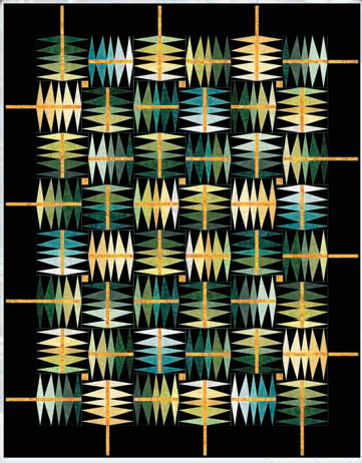 The olive green and dark blue background has been rendered in textured batiks, giving it the quality of a landscape. 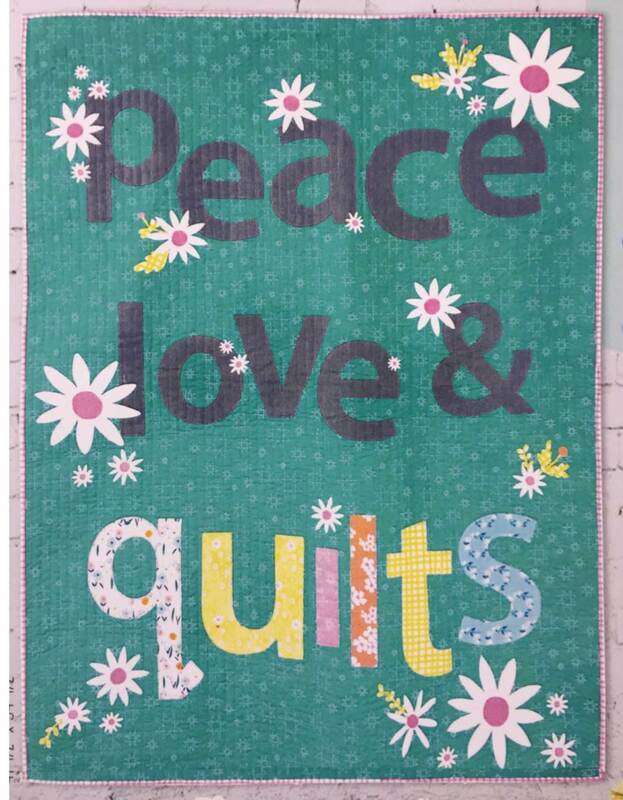 We love the quilt, and the name of Carol's blog, To Be Fearless. We hope that Carol's workshops at OQSO include tips on fearlessness! 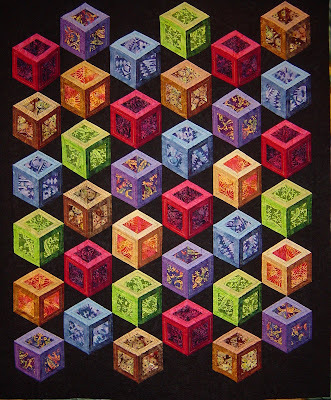 In Blue Cubes, Martha has separated the tumbling blocks from each other so that they appear to be floating. 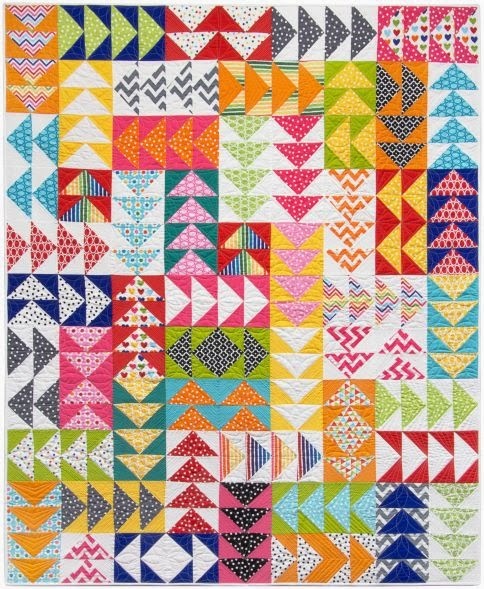 The beauty of this elegant quilt comes in no small part from the hand-marbled cottons, which are arrayed in colors ranging from forest green to teal and turquoise blue. The swirled marbling reminds us of the deep blue sea. Note added on December 22, 2010: the website at marthaborders.com has closed. See a profile of Martha Borders at Smollin.com. The two large blocks in the quilt above are a remembrance of the Twin Towers in New York City. 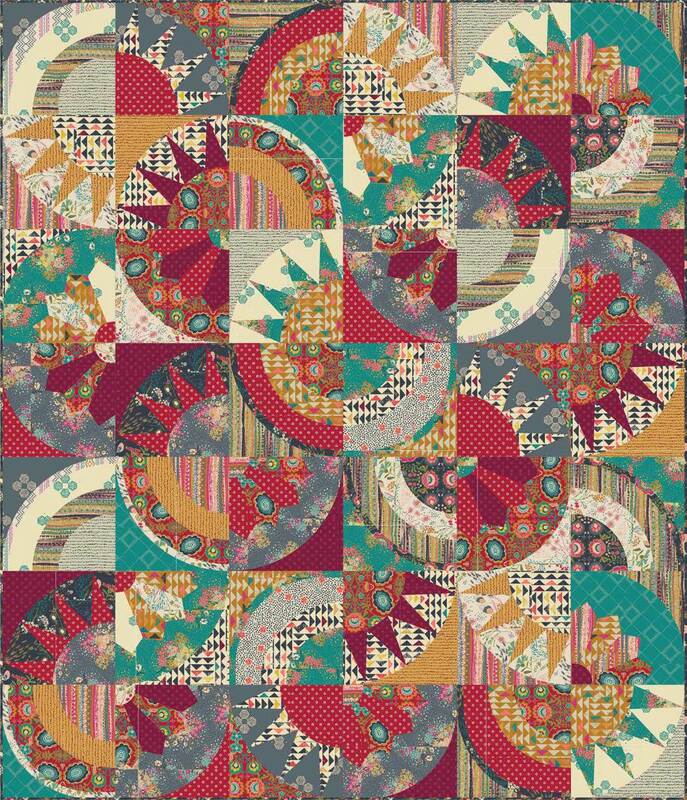 The blocks are constructed with crazy patch piecing, using fabrics in shades of rust and blue with red accents. 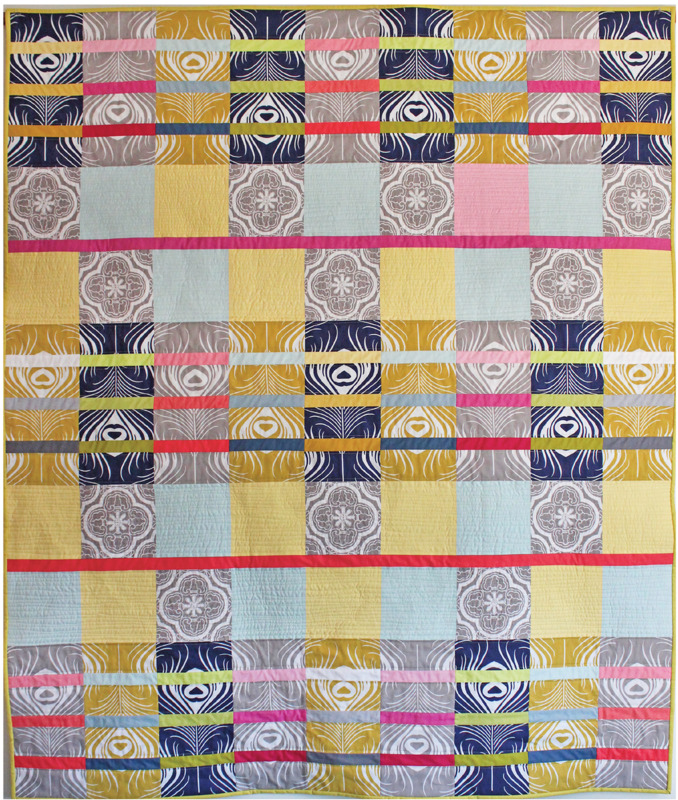 BJ combined hand-dyed and painted fabrics, commercial batiks and geometric prints, satins and lames. The linear quilting on the building surfaces adds shading and dimension. 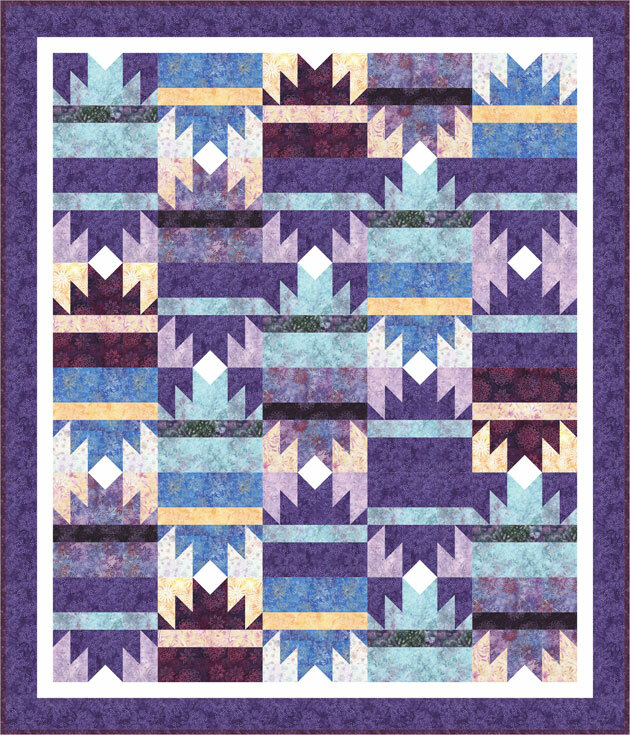 The pattern for this wonderful quilt can be obtained at Piecemaking, LLC. 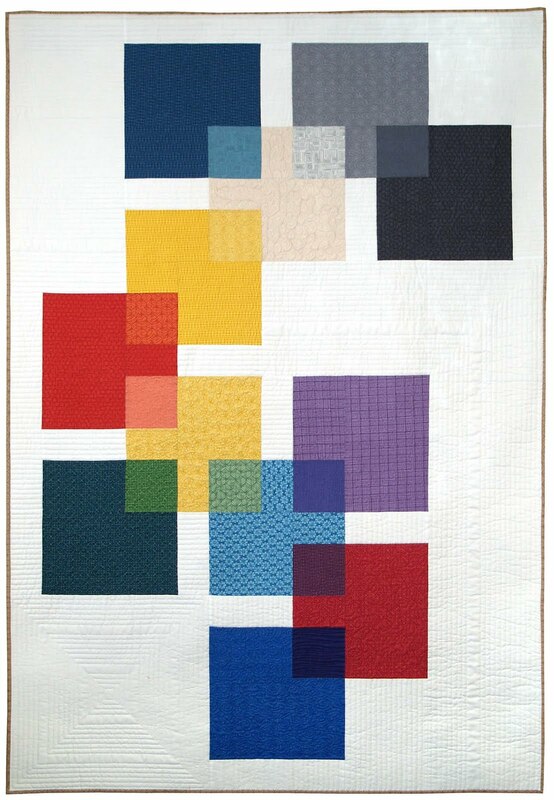 In this original wall hanging, Jane has combined hexagons with tumbling blocks and elongated cubes, all in muted primary colors. 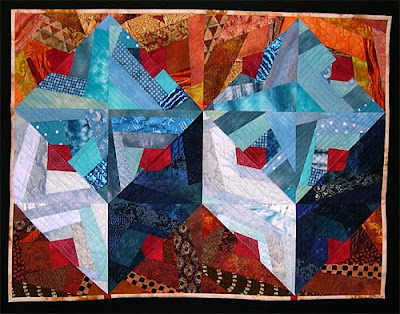 The juxtaposition of shapes, and the angled arrangement of the houses, gives this piece a lively sense of movement or "rhythm". For more information and detailed views, visit Jane's Quilts. 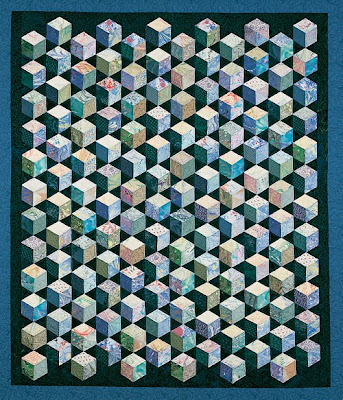 The hollow cube pattern is from Sara Nephew's Big Book of Building Block Quilts, available at Soft Expressions. 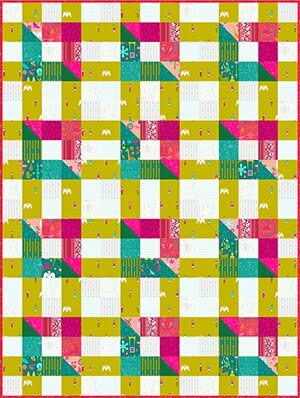 The Attic Windows pattern is one of the most popular and best loved of all three dimensional quilt patterns. It is captivating because it draws the eye into a "shadow box" effect that leads us to believe that we are peering either into or out of a window frame. 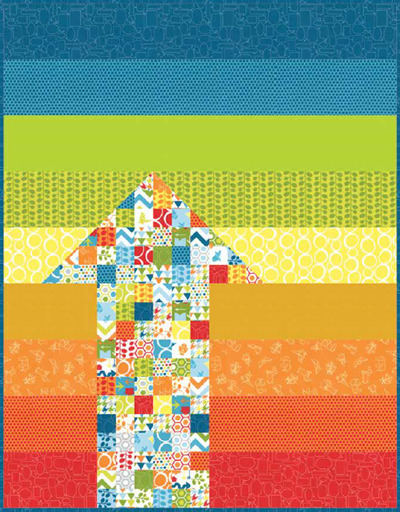 Successful Attic Windows quilts employ three aspects of the color scale: value, hue and chroma. The word value is used to describe the lightness or darkness of a color. 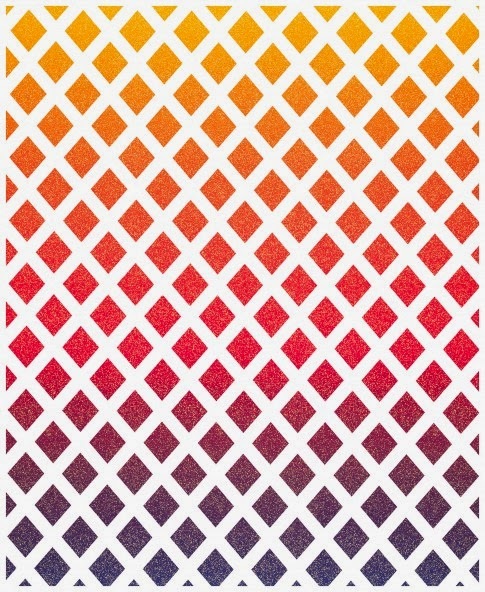 Hue is used to describe the warmth or coolness of a color. Chroma is used to describe the purity or brilliance of a color. 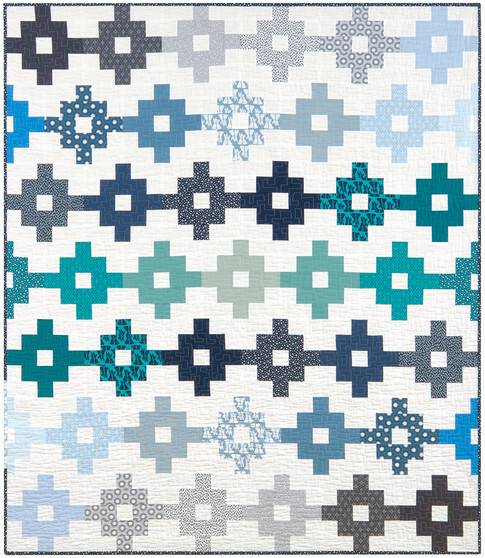 Attic Windows quilts can be designed to either give the impression of standing outside looking in, or standing inside looking out, depending upon how the fabric palette is used. Lynne Hatwell, from Devon, England, creates a captivating work in a tribute to poet Emily Dickinson's line: "The inundation of spring enlarges every soul." 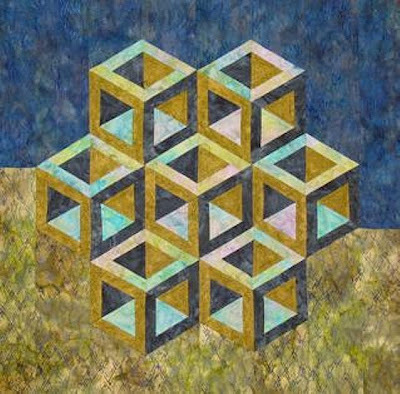 In this pattern, two trapezoid shapes frame a square block, giving the illusion of a multi-paned window with a scene in the distance. Here, it is easy to imagine that we are outside, with friendly butterflies, looking into an enclosed, private flower garden. 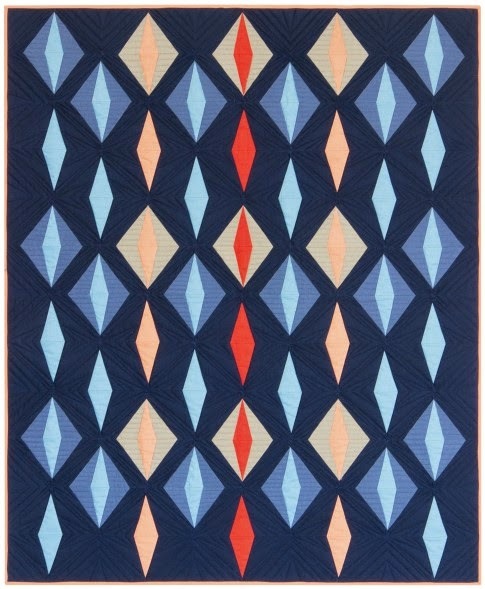 The quilter uses two different values of blue fabric, to give the illusion of sunlight illuminating part of the window frames. 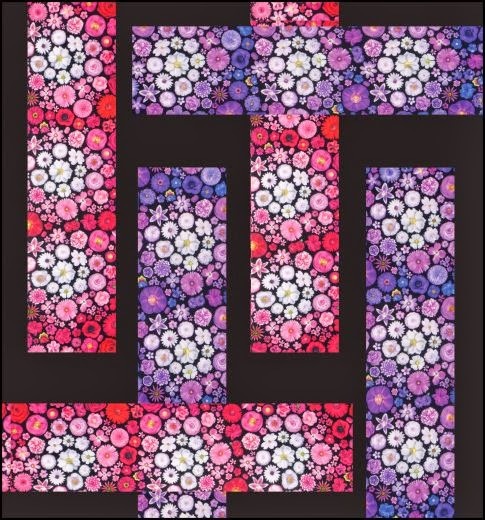 She employs large scale prints very effectively, providing the impression of real springtime blossoms. 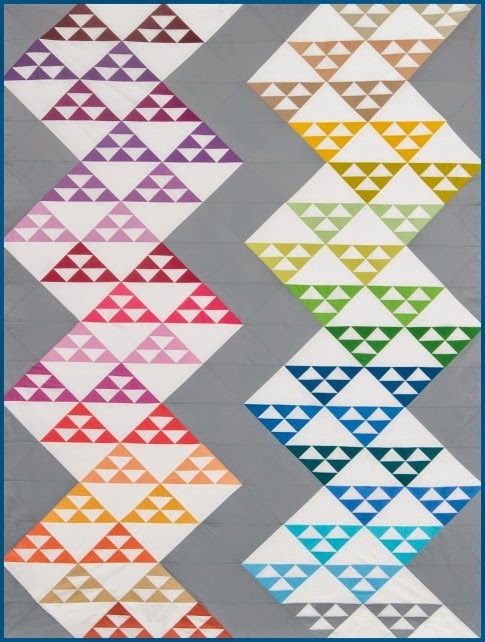 Alice Kay Arnett of Wyoming uses the cool hues hues of white and charcoal gray fabric on her window frames. These wintry tones give the impression of standing inside at dawn, looking out, as the birds awaken and the first rays of sun dispel the night sky. She has added interest by varying the size of the window panes in order to display more of the bird at work in their natural habitat. 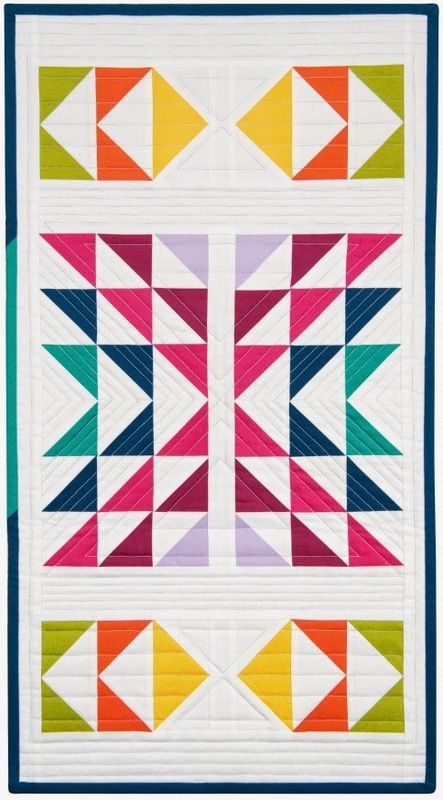 The traditional feather quilting on the panes adds to the delightful effect of this quilt. 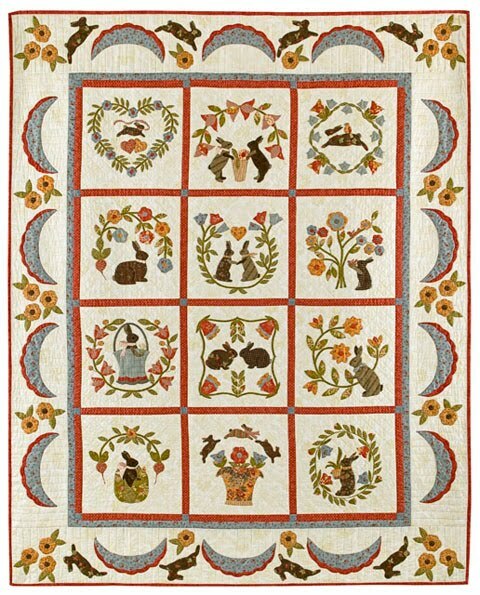 Jacqueline Johnson of the Empire Quilters in New York City explains "For a long time, I owned a cat, but wanted fish. 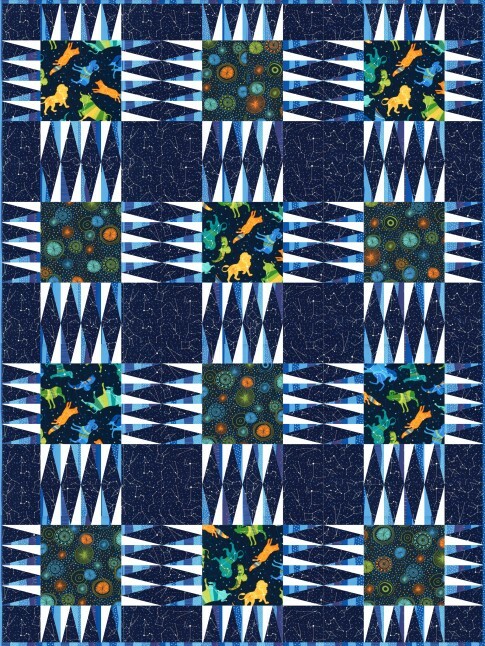 My solution- this fabric aquarium." 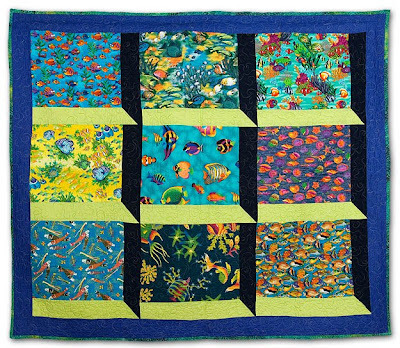 Jacqueline has effectively created a cat's eye view of tropical fish as they dart and glide through the water. 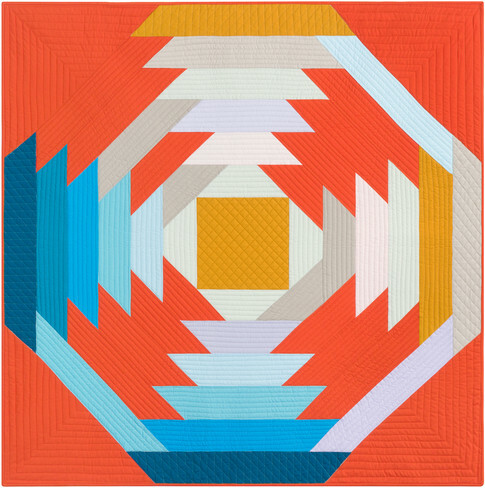 Her quilt makes very effective use of the strong chromatic colors of turquoise and aqua blue. They possess high chroma because they are pure, bright, undiluted colors. 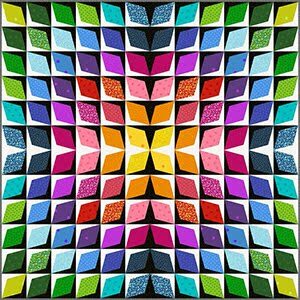 Because these blues have not been muted or shaded by adding brown, gray, or black, the viewer sees them as vivid and intense colors. Jacqueline has used this intensity to effectively portray a vibrant world swimming with life and movement. 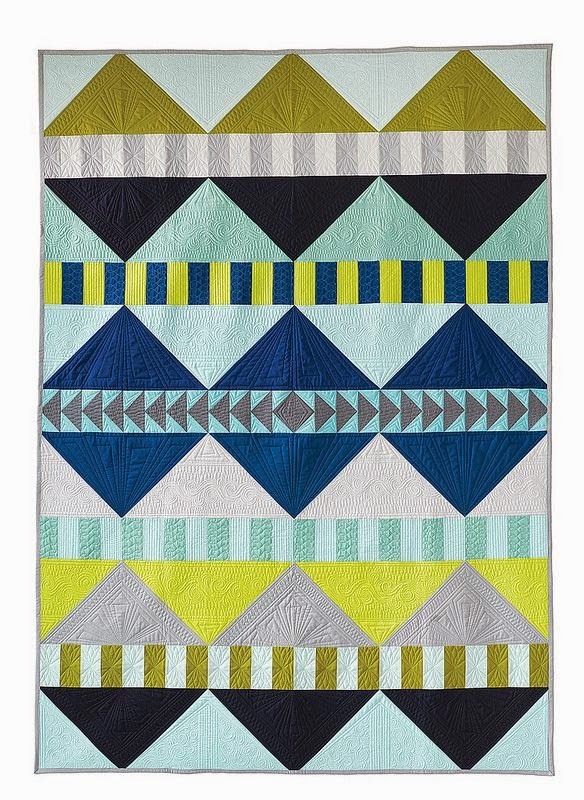 This charming quilt is enhanced by the value contrast of the light green and dark blue window panes, which increases the three-dimensional effect. 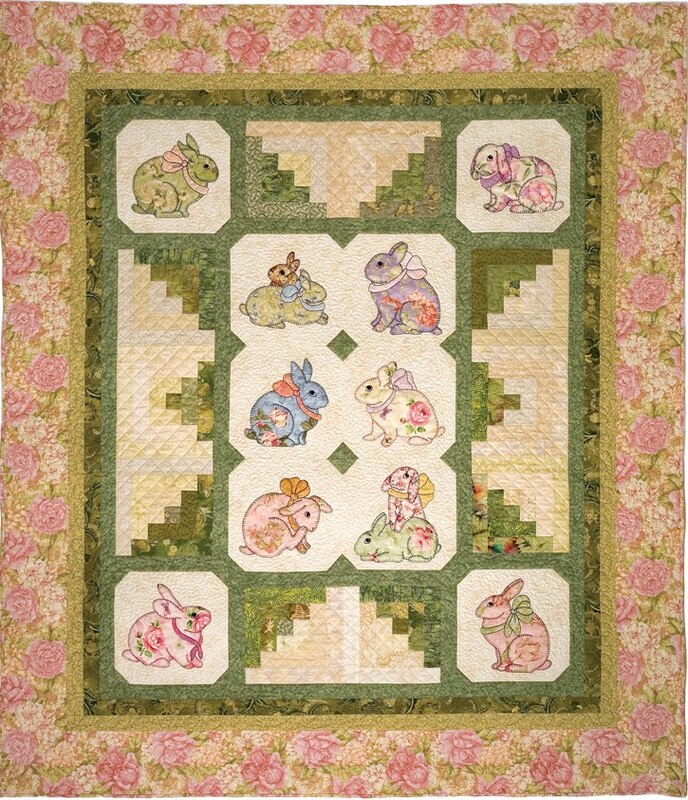 Image Credit and Links: The Inundation of Spring, courtesy of Lynne Hatwell at Dove Grey Reader; Bird of a Feather, by Alice Kay Arnett at Alice Kay Quilts; Aquarium by Jacqueline Johnson, courtesy Empire Quilters. 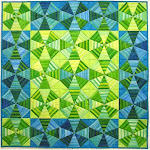 With St. Patrick's Day fast approaching, we're celebrating quilts that are as green as the Emerald Isle itself. 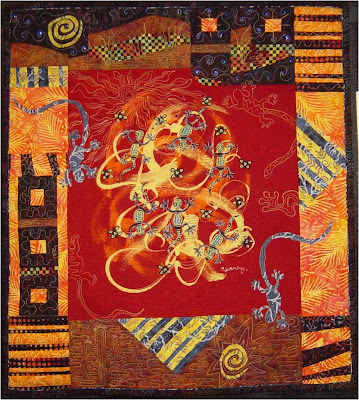 Below, we are featuring works of fiber art in distinctly different styles. 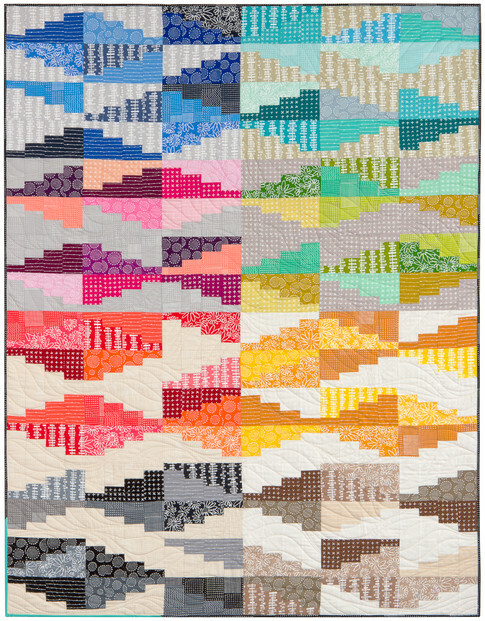 Amy Mundinger has created a beautiful 24" x 24" wall hanging of aspen leaves, whose lovely shades are enhanced by the carefully composed, neutral tones of the surrounding blocks. 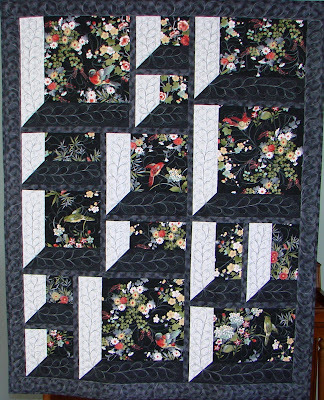 This quilt has hand-dyed fabric appliqued leaves on a solid background (machine satin-stitched) and a pieced black and white border using various prints. Amy states that she gains inspiration from the Rocky Mountain landscapes and especially micro-landscapes, such as a picture one would take with a telephoto lens of leaves having fallen on the ground. 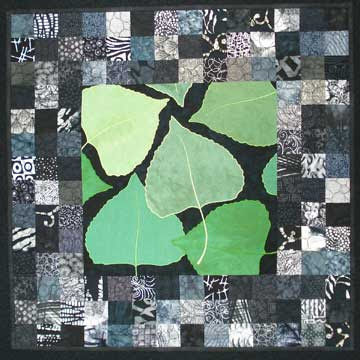 However, her technique in the studio is to draw enlarged leaves in her sketchbook, cut the leaves out of fabric and then spontaneously arrange them on the fabric background. 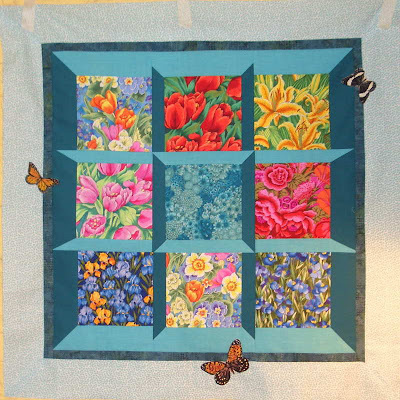 After the border is added, she machine quilts the border, but has left the center panel unquilted for maximum effect of the applique. Her fresh, original designs have made their way into many private collections. To see more of Amy's work, visit her galleries. 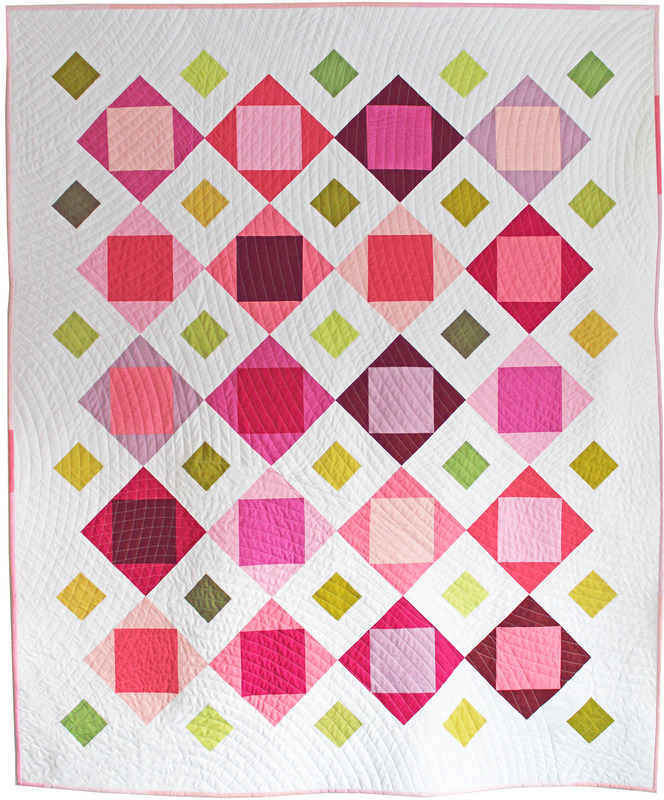 Above, we feature a contemporary Double Irish Chain quilt by Renee Healy. 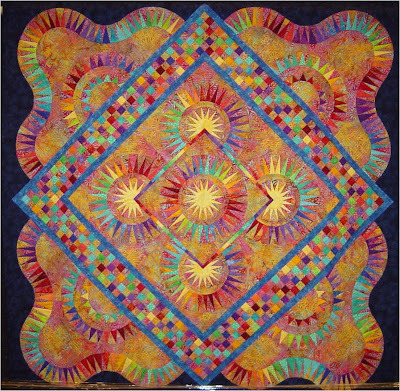 The quilt was shown at the 2008 "Voices in Cloth" quilt show, a production of the East Bay Heritage Quilters (California). 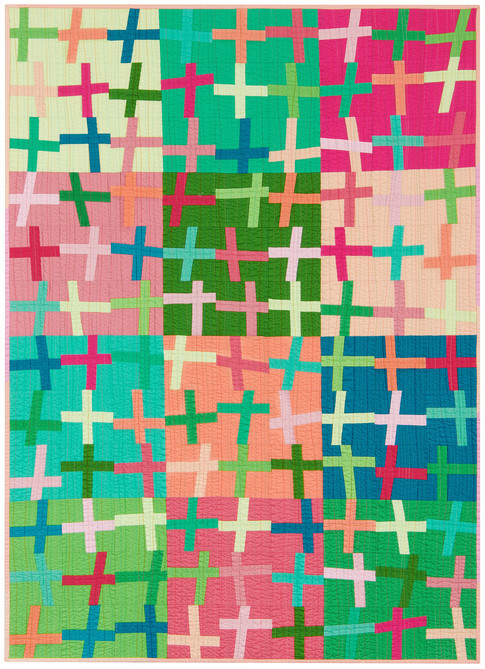 Renee displays the traditional vibrant lattice patchwork for which Irish Chains are known. She also modernizes her art by the addition of a serene blue stream of water, which gently meanders through the dappled green landscape, giving this lovely scene a dreamy, three-dimensional quality. We love the way that the river of water disappears into the landscape, beckoning us to follow it. 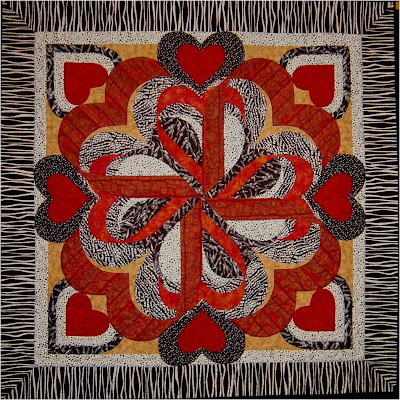 For information on the upcoming "Voices in Cloth" quilt show (April 10-11), click here. 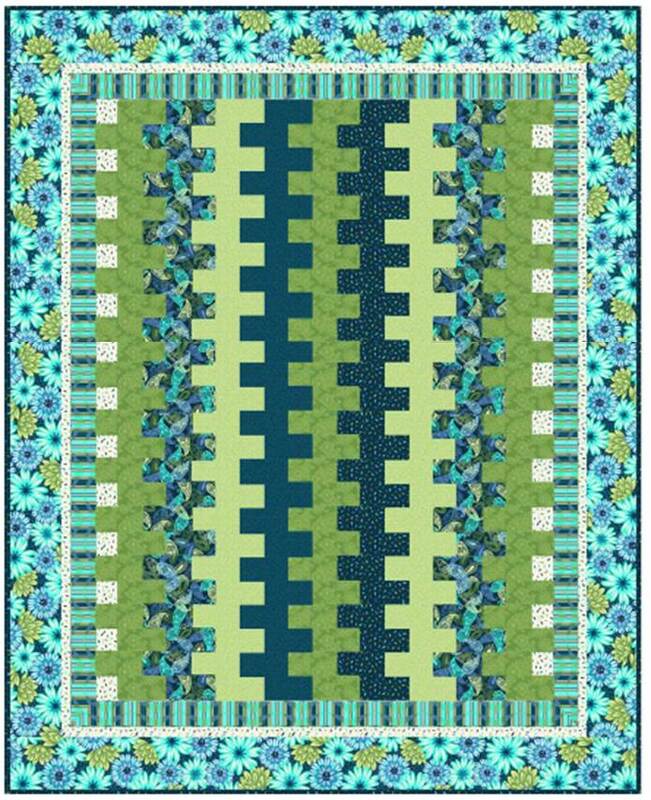 Image credits and links: Aspen series - green, courtesy of Amy Mundinger; Irish Chains Christened, by Renee Healy, East Bay Heritage Quilters.